Another innovative format from PokerStars did not last long - is time, just after six weeks, the operator decided to abandon game known as Unfold Poker. Players from all over the world had a month and a half to try the new games out. The most interesting rule about them was an option to get back in the game after making a fold. – Due to a strategic analysis that was made we decided to let Unfold go – said Severin Rasset, man responsible for poker innovations in PS. According to PokerFuse Unfold was to disappear from software on Monday, September 10th, but in the end it lasted a bit longer. Probably it will be gone for good next week. 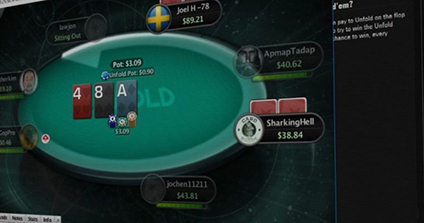 As you may remember Unfold Poker was third format, that PokerStars decided to try out. The game had its debut in Denamrk on August 1st and after satisfactory tests it was introduced globally. Daniel Negreanu back then said it was a good idea and compared Unfold Poker to games like 7-Card Draw or NL Holdem – they initially were also not so popular, but then won the hearts of players over. – PokerStars wants to create new games and test them in order to satisfy clients. Of course not all of them will be available infinitely, but with right tests, listening to feedback and analyzing the needs we will surely deliver new offers, games and updates. These are bound to attract new faces to the game – adds Rasset. Worth reminding you that in its first post on the subject PokerStars informed Unfold Poker will be available all the time. Time has shown however that the game shared the same fate as Split Holdem and Showtime Holdem, that were also to conquer the market.